I really like to think that I do my best to feed my family good healthy real food. Breakfast for my Joe and my son is either muesli or fruit & fibre, and I even bake the bread that goes into their sandwiches for lunch which I always manage to pack loads of salad into, and we all eat the same thing for dinner which is invariably cooked from scratch by either myself or Joe (mostly me though, I *love* cooking, it's really therapeutic). However, as my meals tend to be small and frequent and I am mother to a teenage son who is growing at a ridiculous rate and have a boyfriend who is training for a particularly arduous mountain-based cycle race in France - we need fuel to keep us going in between these meals! We don't have crisps, chocolates, sweets, biscuits, cakes etc in the house. I just refuse to buy them and therefore they're not expected to be there so that's cool and not an issue. 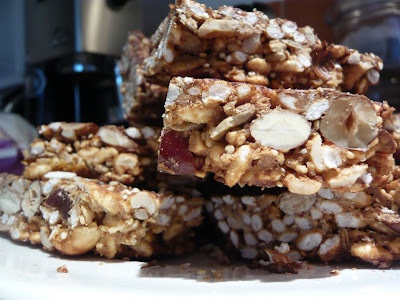 However, in addition to the yoghurts and fruit in our fridge I do buy fruit and nut cereal bars. My son's current faves are Kellog's Nutri-Grain Elevenses in Raisin. 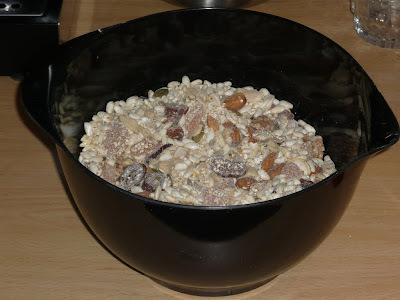 Cereals (36%) (Wheat Flour, Rolled Oats), Invert Sugar Syrup, Raisins (10%), Glucose Syrup, Apple, Sugar, Vegetable Oil, Skimmed Milk Powder, Emulsifiers (E475, E472e, Soy Lecithin), Raising Agent (E500), Flavouring, Modified Starch, Salt, Cinnamon, Molasses, Stabiliser (Guar Gum), Barley Malt Extract, Antioxidant (Ascorbic Acid), Niacin, Iron, Vitamin B6, Riboflavin (B2), Thiamin (B1), Folic Acid, Vitamin B12. Three E Numbers! And does it really need all the rest that's in it? Okay so sugar isn't the *highest* ingredient but it's damn near close in 2nd place! Oh, and look what comes 4th - Glucose Syrup!! Hmm, this ostensibly innocuous healthy bar may not be all that it seems. 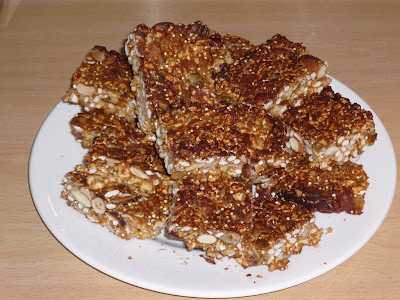 Of course, you can get bars that have very few ingredients which are all 'natural', but these tend to be items like flapjacks - (fat)butter, sugar (white), oats, more fat (oil), tonnes more sugar (syrup) etc etc... heh, tasty, but probably not something you want to eat every day!! 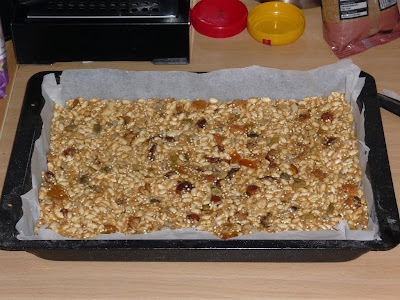 So, inspired by my recent foray into the world of wonderful cold-pressed only-natural-ingredients yummy bar goodness courtesy of such companies as Wholebake and Natural Balance Foods, I thought I'd give it a bash at making my own, at least then I know EXACTLY what has gone into them and therefore what I'll be putting into myself and family - sweet! And, without wishing to blow my own trumpet I think I did rather well considering it's the first time I've ever made anything like this ... but then I have two biased fellas living with me, and me - well I'll eat just about anything! Here's the method, it really couldn't be easier! 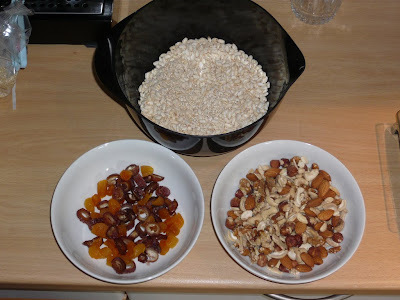 3) Weigh out the puffed wholegrain rice, quinoa and oats into one bowl, your mixed nuts into another and then chop up your dried fruit into bitesize pieces. 5) (I don't have pics of this unfortunately) mix the honey, peanut butter and sugar into a bowl and stick in the microwave for about a minute (can't remember exact time) until the peanut butter and honey have mixed into one lovely gooey runny mess (if you don't have a microwave you could heat it all in a pan on the stove for a bit until it all runs together). 6) (the fun part) mix the *whole* lot together in a big bowl, vigorously, and then (before you get tempted to take out a spoon and start eating) tip the mixture into the lined pan and press down really really firmly with the back of a spoon until it's all evenly distributed and nicely compacted. As I said I'd like to tweak the recipe and I have already bought some blueberries and strawberries for the weekend so get ready for round 2! 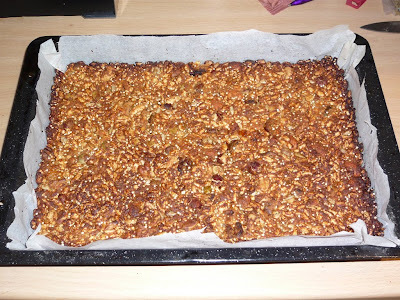 I'm very pleased with them though, particularly because they didn't fall apart and taste pretty decent! These look so good! I gotta try them too. I have a bag of almonds about to go rancid so this is perfect! Thanks! its a bummer when you think they are healthy, I buy the littlun organix cereal bars, packs of 6 and a few different flavours no E's at all. http://www.organix.com/node/2818 they are handy as a workout snack too. Annie... hmm rancid almond bars, nice?! ;-) haha seriously though I hope you found a good use for your almonds, they're such lovely nuts (ooer! ), I have to hide them in my place or my son scoffs the lot! As a doctor, I am impressed with your stance on nutrition and the way you take charge of breakfast. I really wish more people followed this type of strict regimen for their daily health. Please stop by my health blog sometime. The web address is http://healthy-nutrition-facts.blogspot.com/. because it has only 4 ingredients and no nasties. 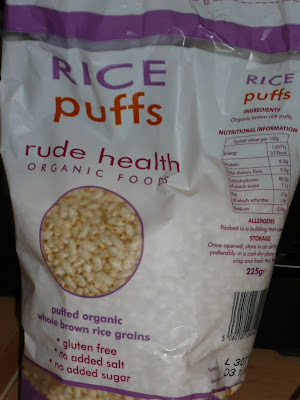 the packet has percentages on so i mixed the ingredients as grams. as soon as you add berries it becomes sticky and binds together. Line small tub(about 3in by 2in was right for the quanties i used) with cling film. fill and cover the film over. Put another container same size inside like stacking and gently press. or with spoon. lift out of tube and gently unwrap and turn out onto grease paper on a baking tray. Take out and devide into 3 bars. my weigh about the same as the nakd bars and very pleasantly suprised how they turned out. moist and chewy like the real thing :-)) going to try choc/orange.